Experimental setup for the femtosecond laser-induced airflow formation. A femtosecond laser beam is generated by a chirped-pulse amplification laser system. A green laser beam is used as the probe beam and co-propagates with the femtosecond laser beam into the chamber. Intense femtosecond lasers can achieve self-guided transmission over a long distance in the Earth's atmosphere, which provides a more environmentally friendly alternative to current technologies for local weather control and rainmaking/snowmaking. 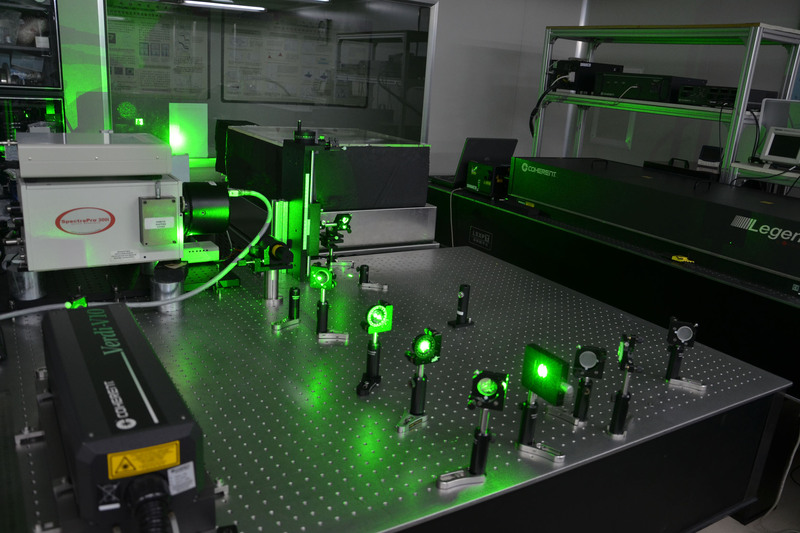 Researchers from the State Key Laboratory of High Field Laser Physics, Shanghai Institute of Optics and Fine Mechanics (SIOM), Chinese Academy of Sciences (CAS) conducted a series of studies about water condensation induced by femtosecond laser filamentation. Recently, this team proved that vortices formed both below and above the filaments in different ambient gases. The details of the study are reported in Chinese Optics Letters, Vol. 14, No. 3, 2016 (Vortices formation induced by femtosecond laser filamentation in a cloud chamber filled with air and helium, corresponding author: Prof. Jiansheng Liu). The laser-induced water condensation has been confirmed both in the atmosphere and in a cloud chamber. In this process, laser-induced airflow was identified to play a key role in water condensation and snow formation. However, the conditions and the formation mechanism for vortices have not been fully understood yet. In order to understand the mechanisms of the formation of the laser-induced airflow, airflow generation in different ambient gases was observed. The experimental and theoretical results show that vortices always form both below and above the filaments. In the experiments, femtosecond filaments were generated when intense ultrashort laser pulses were fired into a cloud chamber filled with air or helium. Vortex motion induced by laser filaments in a cloud chamber filled with air was observed only below the filaments, while vortex motion in a cloud chamber filled with helium was observed both below and above the filaments. The airflow in the cloud chamber was simulated by numerically solving the continuity energy and momentum equations of gas while using laser filaments as heat sources. The simulation results show that vortices also form above the filaments in air. The airflow above the filament was not observed in the experiments with air because of the formation of smaller particles followed by a weak Mie scattering signal. The results are essential for understanding the process of the formation of laser-induced airflow and the mechanisms of water condensation. The following work will be focused on the physical mechanisms of vortex formation using different experimental methods and theoretical simulation in order to lay foundations for achieving weather control by lasers.